So many industrial foods have been marketed as “health foods”, through advertising or marketing campaigns, no one doubts anymore about the fact that they are so healthy and good for them. And as Mark Twain said, “it is easier to fool people than to convince them they have been fooled”. My only goal is to educate and give people some foods for thoughts. I would advise everyone to not just believe in what I am saying, but to do their own research and dig it out by themselves. What we call “dairy” is anything made from milk from cows, goats, sheep… EXCEPT BUTTER. “Conventional” dairy is any type of dairy that is NOT FROM grass-fed, organically raised animals. Most dairy today is pasteurized. It basically means that it is “cooked”. Once collected, it is raised at very high temperature (about 150°F, or 65°C) for 30 minutes and then rapidly stored at a temperature lower than 55°F – or 12°C. This is done to substantially reduce contamination risk. The problem with pasteurization, is that it kills almost all beneficial nutritional benefits from milk. - Calcium in pasteurized dairy is USELESS to human body. It is a mistake to think that it is a healthy source of calcium and vitamin D. If you are looking to increase your calcium intake, think of dark leafy greens instead, like broccoli or spinach for example. Their calcium content is much more absorbable and much higher than any residues in conventional milk or dairy. So yes, you get it. Pasteurization transforms milk into a very unhealthy and even harmful “food” (I would actually call it a “dead food”). Because of all those negative consequences, pasteurization has been linked to neurological disorders due to a high level of neurotoxicity. 3. And what about homogenization? Homogenization is a process developed so that the “fatty” cream of the milk does not separate anymore. This is done chemically, and as you can imagine, it alters the milk in quite a bad way. It has been shown to increase oxidative stress, as well as risk of cardiovascular disease. Because of those bad sanitary conditions, most of the cows were sick, and all this led to rampant contamination of milk, making people sick. This is why pasteurization became necessary and was developed to sterilize THIS kind of milk. Conventional dairies feed cows unnatural, inflammatory and sickening diets. Many times, animals are kept in dirty, cramped conditions, making actually pasteurization…necessary. Those animals are sick, and need antibiotics, are injected with growth hormones, to make production more “efficient”. Because of all of this, conventional dairy is far from being safe nor healthy. Most of the food poisoning outbreaks regarding milk were happening to pasteurized dairy. The low quality of this “milk” makes it very weak and attractive to all kinds of bad bugs and bacteria. The fact that there are several steps in the process (pasteurization, homogenization, storing, transport, storage again….) makes it more prone to bacteria contamination, each step of the way. So what is the solution if you don’t want to stop consuming dairy? Raw Milk is basically milk that comes straight from an animal that is organically raised and grass fed. It is NOT PASTEURIZED, NOT HOMOGENIZED. No hormones, no synthetic substances are added. It is unadulterated milk. Raw milk is basically milk in ITS FRESH NATURAL STATE. It should be called milk. Pasteurized or conventional milk should be called “processed milk”. Grain-fed diets given to cows in conventional dairies are highly inflammatory and make the animals sick. They get contaminated with mycotoxins (from grains), pesticides or other chemicals, and are filled with growth hormones, antibiotics (because those animals are so sick they need them), vaccines waste (yes, not that good as you can imagine), all causing harmful diseases to humans like chronic diseases, or even cancer. This is another reason why Raw Milk just makes sense. It is a powerful healing food meant to sustain life. In its all natural state, raw milk is nutritional, and helps naturally boost your immune and digestive system, because it is full of living component such as enzymes, probiotics, vitamins, minerals and healthy fats. Because animals graze on green pastures, filling up on sunlight and fresh air, raw milk is a very trusted and clean source of food. There is in average a 24 to 48 hours window between the milking of the animal and when it arrives at the consumer’s house. This is very short and that is why raw milk is so fresh and still has so many beneficial health properties. - Grazing cows are healthy, strong, robust. Their gut is healthy and their gut flora is balanced, with great amount of healthy bacteria. - Cow’s teats are cleaned with iodine before milking. This is a great, effective, clean way to kill potential bad bacteria. - Milk is then collected in sterile stainless containers, and immediately refrigerated. - 24-48 hours later, consumers have it in their home. This is a very clean way of preserving all powerful health benefits of fresh milk: minimal storage, limited transportation, no processing. This allows very little chance to contaminants to take over. On top of it, this fresh raw milk has so many living immune factors and enzyme-based pathogen killers that it can, by itself, fight off the bad bugs. This is not the case in conventional pasteurized milk that doesn’t contain any of it anymore. Than children fed with conventional pasteurized milk. All this explains clearly why. So yes, if you want to go on eating or drinking dairy, go for raw, organic, grass-fed sources. As I said at the beginning, BUTTER is not considered a dairy food. This is because during its fermentation process, milk proteins are enzymatically modified. Many lactose-intolerant people can eat butter with no side-effects. If you don't feel well with butter, ghee should be your solution. Again, here I am talking ONLY ABOUT RAW, ORGANIC, GRASS-FED sources. 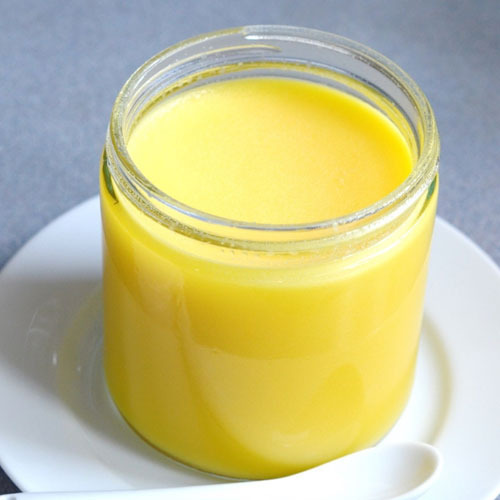 Raw Butter and Ghee are an exceptional source of healthy protective fats. Those fats flush out the bad ones. So no, you won't put on weight because you start eating them, it is quite the opposite actually. And no, don't be afraid for your cholesterol levels. Again, these are beneficial fats that will help you get back in balance and will help improve your hormones levels, your cholesterol and are an amazing food for diabetics. For nursing moms or newborn babies, it is the second best choice (after breastfeeding…). Beware of all industrial milk formula that are full of synthetic additives, synthetic nutrients and can be quite toxic to the babies. If you want to know what to give to your baby and when, PLEASE READ HERE the different amazing reading sources that will help you on your way.